Any mother with more than one child can tell you she saw differences among her children from the earliest ages. Some babies are easy-going, happy to watch a mobile while Mom attends to other things. Others are more intense and demand more of Mom’s time from the very beginning, never happy unless they are with someone. Some contentedly play with toys while others are driven to move and explore. Temperament is the innate behavioral style we inherited. Personality is how our temperament develops over time based on environmental factors such as education and family structure. The ancient Greek doctor Hippocrates first advanced the idea of different temperaments. He named four: sanguine (extroverted and sociable), choleric (ambitious and decisive), melancholic (introverted and thoughtful), and phlegmatic (easy going). Modern psychologist David Keirsey refined these to four major types with 16 variants—the now-famous Myers-Briggs. Last month, I had brunch with Dina and a few other local writers. Dina led a short discussion about using personality “types” to develop fictional characters. Her mention about how our personality affects our relationship with God got me to thinking about the personalities of some Biblical people. Let’s start with Peter. I’m sure we’ve all met people like Peter—outspoken, impetuous, and always in the thick of things. When the disciples saw Jesus walking on the water, Peter jumped out of the boat to try it too. When the soldiers came to arrest Jesus, Peter whipped out his sword and hacked off an ear. And he always had something to say even if it was the wrong thing, like the time he contradicted Jesus. I'm sure he was a lot of fun to be around—when you weren't on the receiving end of his tongue. 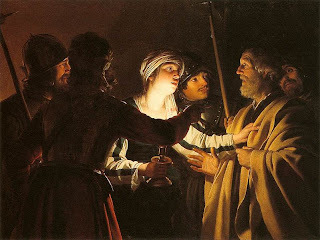 Peter frequently shot off his mouth, and often ended up with a sandal firmly inside. Contrast that with the disciple Matthew. 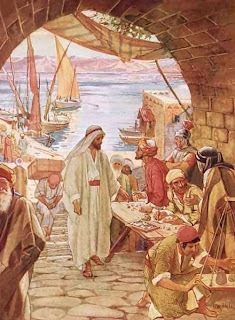 We don’t know a lot about Matthew’s pre-Jesus years, beyond his profession: tax collector. Most Jews hated tax collectors, whom they viewed as crooks and sell-outs to their Roman overlords. Matthew must have been a bit of an Ebenezer Scrooge type—too busy totally his profit and loss statement to concern himself with the opinions of others. Accountant, loner, mercenary. He didn't say anything particularly memorable (until later). But he was practical, preferring to work with the Romans than to dream that one day the Messiah would free the Jews from subjugation. What I especially love about these two examples is that three years with Jesus turned the weaknesses in their personalities to strengths. Outspoken Peter went on to preach before thousands. Two thousand souls were saved in just one day, when Peter spoke the words God gave him. Matthew turned his analytical mind to making the case for Jesus. He gave up everything but his pen, with which he wrote the Gospel of Matthew. This particular gospel presents a logical argument for Jesus as the Jewish Messiah. Matthew's gospel includes more quotes from the Old Testament than any of the others. God uses all kinds of people: Ruth, David, Jacob, Mary, Moses, Daniel, Joseph, Sarah, Paul… But sometimes we look at others, particularly those so very different from us, and wonder if perhaps we shouldn’t change to be more like ___. Or even worse, we try to change others (particularly family members) to be more like us. Fortunately, we have a God who meets us where we are. Which isn’t to say he doesn’t want us to “improve" (i.e., become more like Him), but that he can use us warts and all—and turn those weaknesses into strengths. Challenge for the weekend: Is God calling you to a ministry that utilizes your unique personality? Perhaps you're an artist called to create for His glory and kingdom. Or perhaps you are an exuberant "people person" called to an evangelism ministry. Or perhaps you have an analytical mind that would thrive on teaching an in-depth Bible study. Both tests had me about 50-50 on the sensing/intuitive scale. God does use me and my unique gifts - when I allow Him to, that is. that is my life struggle i think. love the post. going to see if hubby will be willing to take the tests too. will be like pulling teeth i fear *heh* INTROVERT is a definite on him, after that... a learning op for me. Deb -- my long lost twin! Those results were similar to mine. I got INTJ on one version and ISTJ on the other. The S-N must be pretty close to a 50-50 split. I'm strongly to the introvert. The idea of knocking on doors terrifies me. But when I turned my writing over to God, it was a perfect fit. My books are sold in Walmarts in towns I will never get a chance to visit. CJ, I took a personality test and class while I was teaching at a Christian school (I think it was the DISC test) and they looked at examples of characters from the Bible like this. I enjoyed it. After dancing very little for several years, I've been asked to dance at the Greater Philly Writers Conference in a few weeks. That will be a stretch of my gifts, but it should be good. It certainly fits my personality (INTJ like Lisa) and I've been feeling pretty strong and healthy for a 42 year old mother of three lately. Lisa, it does make sense that someone who is introverted but has a fairly high sense of emotional perception/empathy would channel that into writing. Are you character focused (as opposed to plot focused)? And it does kind of explain why I have so much trouble writing emotional scenes. They really drain me -- but I'm not as in tune with emotions as many others. But I enjoy creating complex plots! Dina, I was coming up with so many examples -- and my husband said, "How long is this post supposed to be again?" So, I just picked 2 that contrast nicely. You look pretty fabulous for a 42-year-old mother of 3. Enjoy your conference. I've never gotten into the personality tests. I suppose I should. It might be helpful in making the characters I'm working on now more distinct. Is there a good online resource? Barb, I included links to two that I found -- I ended up searching for some because I couldn't find the link Dina had give out last month. I actually use the Myers Briggs for my hero and heroine. I get into their heads and take the tests and then i see the ways that those two personalities tend to relate, just to make sure I'm getting all I can out of them! I really enjoy that part. And it took me a long time to see how i can be of service in the body of Christ when it seems the "people" people are so much more useful. Thanks for reminding me that I'm of best use when I am true to the Me I was created to be. CJ, I wish I did better at creating characters. By all rights they should come to me first, plot is so much easier and funner. Part of that may be because of writing historicals and mysteries. To incorporate real events and "clues" I have to have a more structured and some times a more intricate plot. Oh, oh, oh! "He gave up everything but his pen." I think that just crystallized my current situation! Thank you, CJ! I completely agree Lisa. For me to love a 'character-driven' novel the character must be bigger than life. If not, I tend to be thinking...there's not enough going on, because I want that nice deep twisty plot. An example is Gina's novella. At first glance, a plot about candy shouldn't have enough umpth to interest me but I loved the story because of how incredibly she drew her characters - a gift I don't have, and must really work hard at. Being a 'task oriented person' rather than a people oriented person probably is the reason. I like reasoning out situations more than people but fascinating characters are what make great novels. Especially fascinating characters involved in great events! CJ, I've taken a couple of these tests and I always enjoy "typing" family members. I'm always surprised at how on target they are. And for myself, I always try to learn a bit more about myself. Great post. Love the pictures, too.